المجلس الإسلامي العربي / The Emirates Center for Strategic Studies and Research (ECSSR) hosted a lecture – The Dangers of Sectarian Conflicts and Means to Confront Them – delivered by His Eminence Sayyed Mohamad Ali El Husseini, Secretary-General of The Arab Islamic Council. 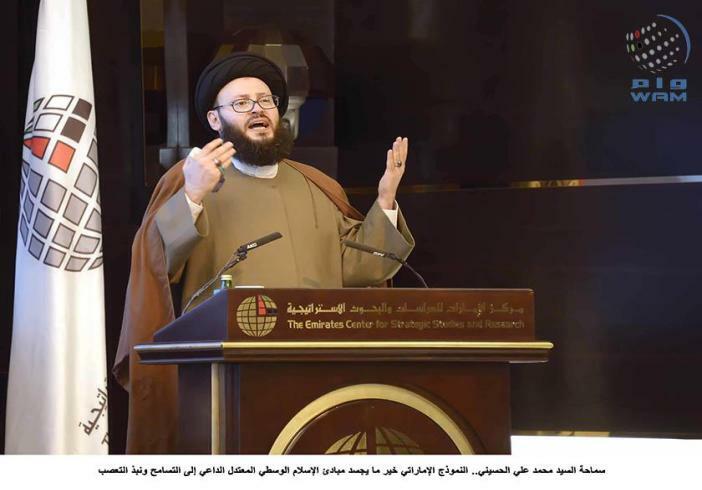 • الموضوع : The Emirates Center for Strategic Studies and Research (ECSSR) hosted a lecture – The Dangers of Sectarian Conflicts and Means to Confront Them – delivered by His Eminence Sayyed Mohamad Ali El Husseini, Secretary-General of The Arab Islamic Council. . 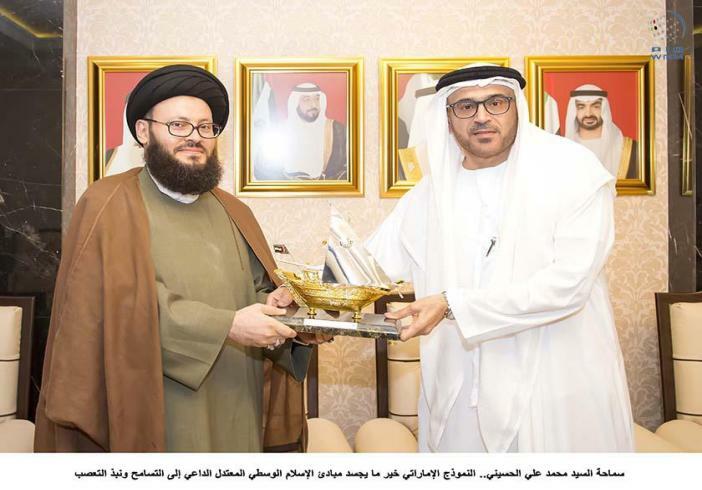 The Emirates Center for Strategic Studies and Research (ECSSR) hosted a lecture – The Dangers of Sectarian Conflicts and Means to Confront Them – delivered by His Eminence Sayyed Mohamad Ali El Husseini, Secretary-General of The Arab Islamic Council. El Husseini :He told an audience of politicians, diplomats, media persons and an elite group of social and thought leaders that religion can only be used to attain political gains through misrepresentation, affirming that talk about Sunni Islam and Shia Islam is baseless because they are two schools divided by politics. 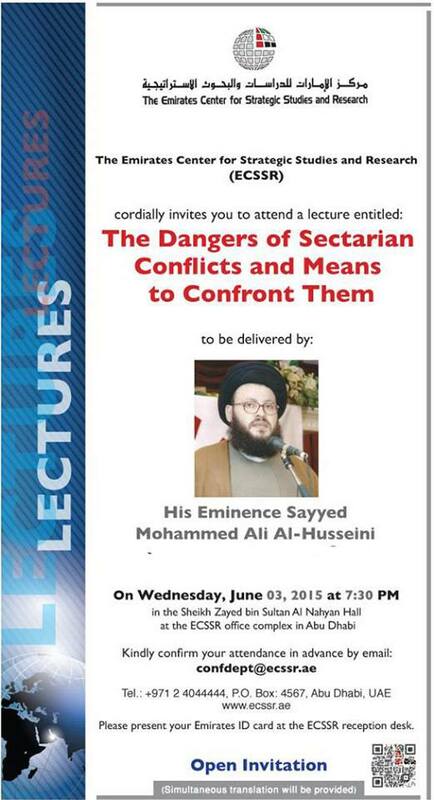 Sayyed Mohamad Ali El Husseini In his lecture titled ''The Dangers of Sectarian Conflicts and Means to Confront Them'', the scholar, known of his open political and intellectual stances, spoke about the serious dangers that sectarianism could inflict on the structure of communities and how it accelerates erosion and disintegration of communities from within, turning them into failed states that were plagued by wars and disagreements that deplete their resources and defame their stature. In this context, sayed mohamad ali el husseini said,'' We find the phenomenon of "Islam within Islam", or those instigating strife within Islam, adhere to their own interpretation of the Holy Quran and the Prophet’s Hadith that deviate from the genuine mission of peaceful Islam, and upon which they rely to promote their own fabricated version of Islam.'' In his view, Daesh were both seeking an alleged caliphate and leadership that justify coercion in the name of religion. • ElHusseini said that the Islamic unity conference in Mecca brought together the nation s scholars on one word namely unity and rejection of all manifestations of extremism.